Educated Cheese: You're telling me THIS guy is a bad fielder? You're telling me THIS guy is a bad fielder? The Gold Gloves were given out last week and it was the usual suspects taking home the hardware and among all the fielding talk someone found a way to try and tell us that Jacoby Ellsbury is a below average out fielder. Actually, of all the AL center fielders the UZR (which I can only assume stands for "Useless Z-something Rating") had him listed second to last, only in front of Vernon "Ridiculously Crippling Contract" Wells. His rating is actually so bad it says that his shifty D gives up 18.3 runs per year. We have entered the twilight zone. Yes I know his arm is only a tick above Johnny Damon, who is barely a tick above disabled infant monkey, but he has made an entire Nation get used to the fact that a diving, lay yourself horizontal 3 feet in the air, catch is something that is to be expected on a daily basis. 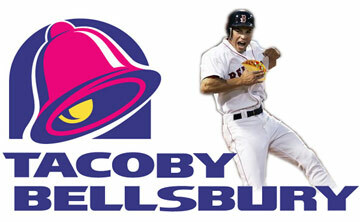 Let the stat guys have their fun but no one is going to convince me that Tacoby Bellsbury is not a good fielder. UZR, to you I say GOOD DAY!! Jacoby is one of the most entertaining people to watch in the outfield....What are they thinking?? The must be paid off..